This news item was posted in Breaking News, Politics category and has 0 Comments so far . Pakistan Muslim League Nawaz (PML-N) Chief Nawaz Sharif has said today that after Supreme Court’s verdict on April 26 against the then prime minister Yousus Raza Gilani in contempt case, the country has no legal government and it is being runned by an illegal regime, Media reported on Friday. Nawaz Sharif said during an emergency press conference in Lahore this evening that today Yousuf Raza Gilani has no legal status and he is sitting illegally on the seat of the prime minister. He added that after disqualification of former prime minister Yousuf Raza Gilani, after Supreme Court’s verdict on April 26, his cabinet was also dissolved. “President Zardari is responsible of prevailing condition in the country; he used all available sources to save his illegal money, kept in Swiss banks. 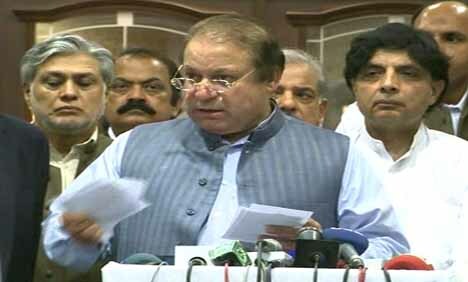 while Yousuf Raza Gilani violated his oath by supporting him to save looted money,” Nawaz Sharif added. Yousuf Raza Gilani must step down immediately and next prime minister should be nominated from the PPP or any other party, otherwise we will use all possible options to remove Gilani and bring a lawful prime minister in the office, said Nawaz Sharif. While replying a question, the PML-N chief said we are ready to use all options including protests, sit-in or long march to get rid of this illegal regime without any delay. Nawaz Sharif appealed to the public that they should be ready to render support in their just cause of getting rid of this immoral and illegal government. The PML-N opposition leader Chauhdry Nisar and many more prominent leaders of the party were also present on the occasion. Chauhdry Nisar also addressed the press conference and said that now Yousuf Raza Gilani is not prime minister of the country and he has lost membership of the assembly as well. He added that despite losing of assembly seat and premiership, Yousuf Raza Gilani was allowed illegally by the Speaker to enter in the Parliament and address during questions’ break. Nawaz Sharif further added that there can be no compromise on looted money and Gilani must apologize and write the letter to Swiss court. We will not allow crushing of law beneath the feet of lawbreakers, added further the PML-N chief, saying that an important meeting of the party leaders has been called on May 30 (Monday) to ponder and finalize a strategy to tackle this situation.